The ferro-resonant, Scott-T design of the PowerHouse Ferro 100 charger will significantly reduce the electricity costs associated with lift truck charging. Both single and three phase chargers are over 83% efficient and have a power factor greater than 0.95. The inherently stable ferro-resonant design maintains DC output within 1%, even with up to 10% AC power fluctuations. The Ferro 100 Charger is able to fully recharge a 100% discharged battery to a full state of charge in 8 hours, while the fail-safe ferro-resonant design protects your batteries from overcharging. 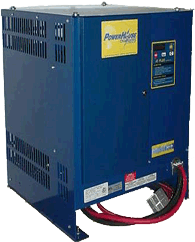 Maintenance costs are virtually zero for PowerHouse Ferro 100 Chargers. The only routine maintenance required is an occasional cleaning with low pressure air to remove dust and dirt accumulation. All of the components are easily accessible from the front of the charger and the chargers all have a low center of gravity for save handling and stacking. The Ferro 100 chargers are all convection cooled, so no fans are required even when they are stacked. All PowerHouse chargers feature a durable and attractive baked-on epoxy finish and can be safely stacked three high.